This fun clip of glam rocker and reality TV star Bret Michaels performing a high-octane take on the '80s ballad "Endless Love" as a paean to Nissan's commercial vans is approaching 1.6 million YouTube views in its first week. Putting an aging star in a wacky b-to-b truck ad recalls Jean-Claude Van Damme's mega-viral Volvo outing from late last year. Here, however, Michaels doesn't attempt to do a split between two Nissans (and, conversely, we're probably lucky that Van Damme didn't sing). 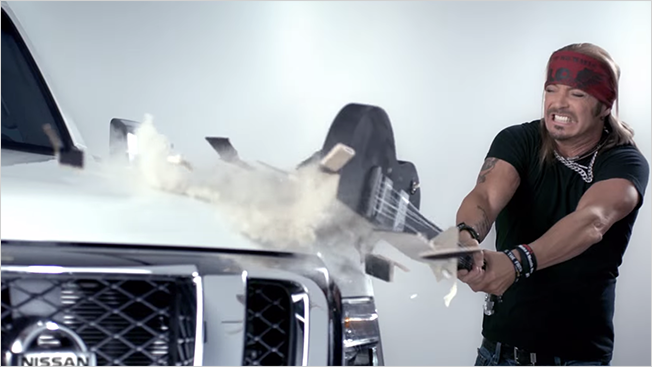 Most reviewers applaud Nissan and its agency, TBWA\Chiat\Day, for their tongue-in-cheek approach and canny casting of Michaels as frontman. After all, the campaign, shot at the automaker's rugged Arizona desert testing facility, focuses on the van line's toughness and resilience, traits that Michaels has come to embody in recent years following his comebacks from thorny health issues.